J&E Window Cleaning had a basic website and wanted to redesign their website to get more customers through organic search results and outrank established competitors. Search engine rankings were an important factor as funds were being poured into Adwords without seeing results. J&E also wanted a great looking and professional website that would appeal to new customers once they arrived at the website. John from J&E Window Cleaning stressed that the new website should load quickly and work flawlessly across all devices, as the old website seemed to take forever to load and was not designed for mobile and tablet devices. We started the project with research into the competitors in the window cleaning industry to see what they were doing, what was working well for them and any opportunities we could pursue to get J&E Window Cleaning the best results. 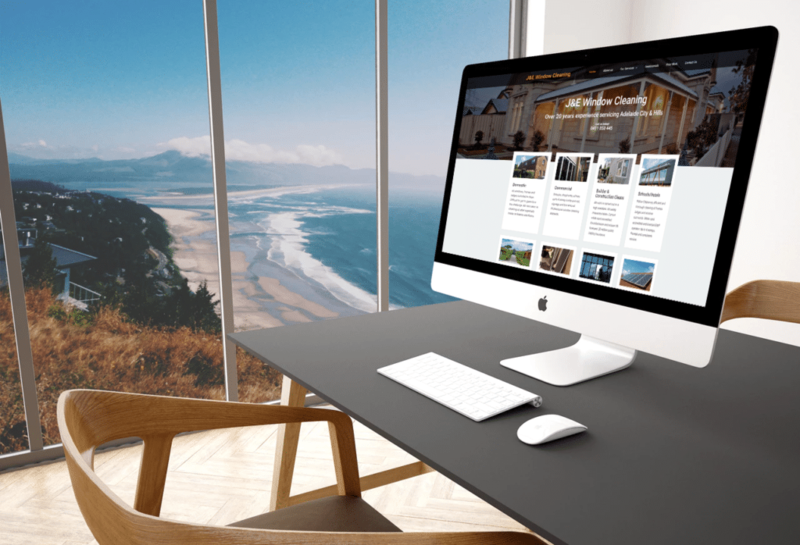 We worked with John of J&E to create locally optimised and keyword targeted website pages that would funnel the visitors to the successful conversion. Google Analytics has been set up to track visitor statistics and track conversions (email & phone contact) so that we can better tell which search engine and advertising strategies are working best. Continual SEO tracking and optimisation has also been implemented to make sure we continue to see J&E climb through the search rankings. We have implemented a testimonial system that displays relevant testimonials on service/location pages, helping to quickly build trust in J&E Window Cleaning which has had a stellar reputation for the last 20 years. The company phone number is prominently displayed on any device so that potential customers can always get in touch without searching for contact information. The website is completely responsive, meaning that it works perfectly across all size devices. Attention is paid to even the slightest detail and it shows. Immediately after launch of the new website we started seeing results. Within the first month we saw a 71.37% increase in new relevant visitors and a 12.5% increase in traffic from organic search. As a result, J&E was quickly receiving more enquiries for work. Our SEO services combined with our continual tracking means that we have been able to see a spike in rankings for targeted keywords. J&E now ranks on the front page for an additional 5 targeted keyphrases in only 3 weeks after site launch and we are continuing to see an overall increase in rankings. The website was moved to our Australian hosting and a combination of caching, minifying, image compression and general site optimisations saw the load time go from the old website’s 6.53 seconds to the new site’s 1.76 seconds. Not only does this help to keep the potential customers happy, it is a key influencer in website search rankings. We are continuing to work with J&E Window Cleaning and coach them through the next steps, maintain and optimise their website and keep the content updated, relevant and SEO targeted. We weren’t kidding when we mentioned that John and his team at J&E Window Cleaning have a stellar reputation. They’re the best in the biz, so if you’re in Adelaide and you’re after a great window cleaner, give them a call!